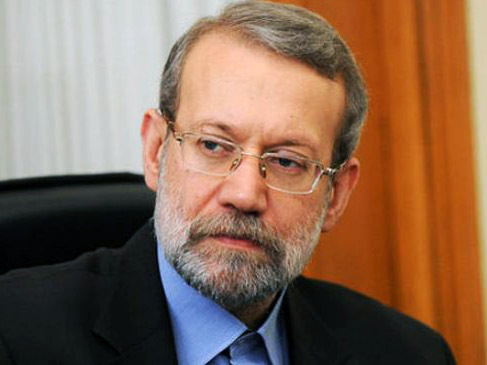 Iran's nuclear issue should be resolved through negotiations and it should be based on NPT rules and regulations, Parliament Speaker Ali Larijani said, IRNA reported. He made the remarks in a press conference in New Delhi on Thursday. Larijani noted that Iran have good potentials and it looks at sanctions as an opportunity for becoming more self-reliant and progressed in various fields of science and technology. 'US should change its behavior towards Iranian nation and change of words will not dismantle Iran's distrust,' the Iranian parliament speaker added. Pointing to the US occupation of Iraq and Afghanistan, he noted that period of dictatorship in the international scene has already ended and it is time to respect nations. 'Occupation of Afghanistan and Iraq which cost millions of lives did not bring prosperity for Iraqi and Afghan people and it has increased both terrorism and unrest in this region,' Larijani said. The Iranian parliament speaker voiced hope for peaceful coexistence of the followers of different religions around the world and in particular in India and Pakistan. Reminding the crisis in Bahrain, Speaker added that Bahrain's political crisis like Syria has no military solution and it should be resolved through dialogue. It should be noted that Iran and the G5+1 held two rounds of talks in Almaty on Tuesday and Wednesday. Saeed Jalili headed the Islamic Republic's negotiating delegation. The G5+1's representatives were led by EU foreign policy Chief Catherine Ashton. During the talks Iran and the world powers agreed to hold an experts meeting in Istanbul, Turkey, on March 17-18 and then continue their talks at the level of their top negotiators in Almaty, Kazakhstan, on April 5-6. Before Almaty talks, Iran and the G5+1 have already held three rounds of negotiations in Geneva, two rounds in Istanbul, one round in Baghdad and one round in Moscow. The last round of talks between Iran and the Group 5+1 was held in Moscow in June. Tehran stresses that the country has always pursued a civilian path to provide power to the growing number of Iranian population, whose fossil fuel would eventually run dry. Despite the rules enshrined in the Non-Proliferation Treaty (NPT) entitling every member state, including Iran, to the right of uranium enrichment, Tehran is now under four rounds of UN Security Council sanctions and the western embargos for turning down West's calls to give up its right of uranium enrichment. Tehran has dismissed West's demands as politically tainted and illogical, stressing that sanctions and pressures merely consolidate Iranians' national resolve to continue the path. Iran has repeatedly said that it considers its nuclear case closed as it has come clean of International Atomic Energy Agency (IAEA)'s questions and suspicions about its past nuclear activities.